On Sunday May 7, about 80 OMGrs, members of Badgerland Striders, Tri-Wisconsin, and a new group called “Finding Your Fairy Tale” teamed up to collect 120 bags of trash on a 1/4 mile stretch of the Oak Leaf Trail between Brady St and North Ave. 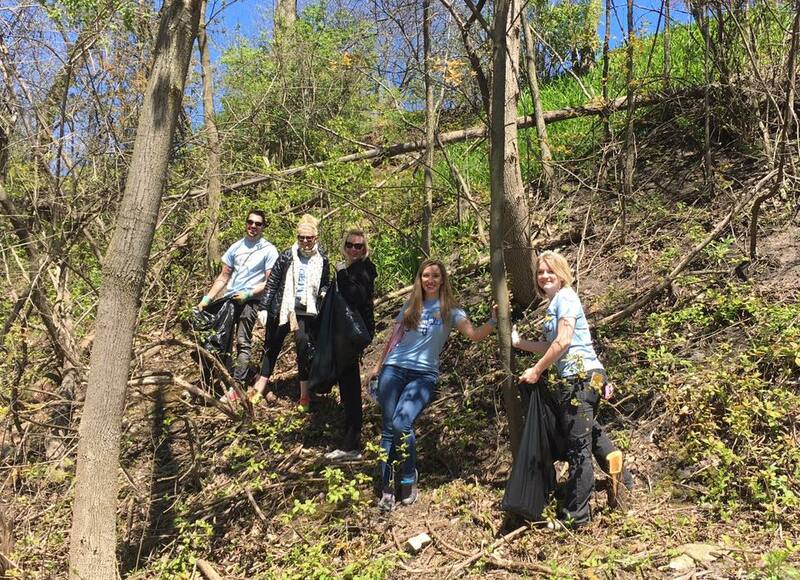 The group cleaned some very hard-to-get-to places along the steep hillsides just south of Farwell — trash strewn and neglected for over 30 years, evidenced by the age of the trash we found. 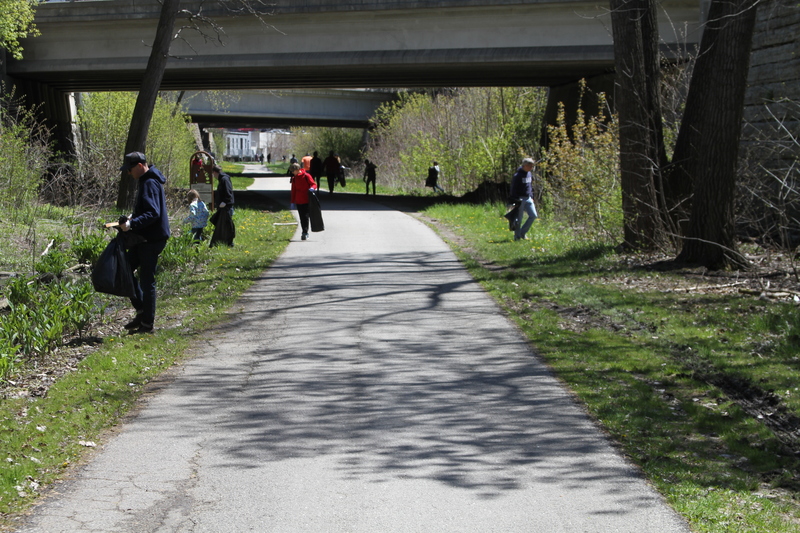 It was a brisk but sunny Sunday afternoon, and the trail was soggy with large puddles that hindered access to some of the trash, but that didn’t stop families, kids, spouses, significants, runners, and bikers from all over Milwaukee from sharing a few hours to help with the cleanup. It was fun watching kids and adults maneuver past water obstacles to get to litter. Ten people using the trail stopped to say “Thank You!” which made us smile. In one hard-to-access section along the trail we found the remnants of a wallet with a $10 and a few $5 laying nearby. Other notables finds included 1/2 of an iphone, a 30-year-old coke bottle, pull tabs (the millennials didn’t know what they were), a sheep’s head, baseballs, a bullet, a driver’s license, rubber snakes and turtles, a AAA card, gas cap, and a large tire filled with mud. We also “found” many thorns on the embankments along the trail south of Farwell, but a determined crew still managed to get it clean. Kudos to those who braved that thicket. There are two types of people in the world, those who work together to accomplish things, and those who enjoy the benefits of other people’s work. Thank you to the 80+ people who made Milwaukee a better place today. About 70 pictures from the day can be found in the photo gallery on our Cleanup Event on Google Photos page and on our Public Facebook and Private Facebook pages.